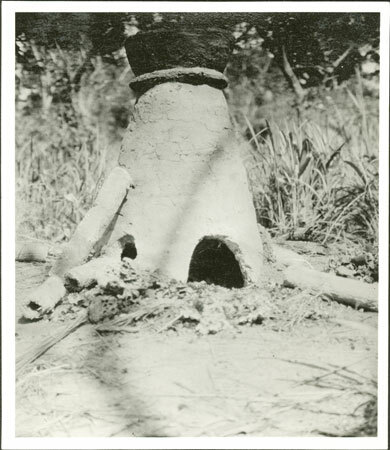 A funnel-like clay kiln with apertures at the base and some lumps of ore. Smelting of iron ore seems to have been uncommon by the mid 1920s due to the availability of trade iron. Morton, Chris. "Zande smelting kiln" Southern Sudan Project (in development). 03 Jan. 2006. Pitt Rivers Museum. <http://southernsudan.prm.ox.ac.uk/details/1998.341.589.2/>.